Starting with the work of Monet this exciting new Royal Academy exhibition ‘Painting the Modern Garden: Monet to Matisse‘ begins on January 20th and will look at the role gardens have played in art from mid 19th Century, through a period of massive economic, social and political change, to the 1920’s. This unique collection of paintings on display in London features many works from some of the world’s most celebrated artists. 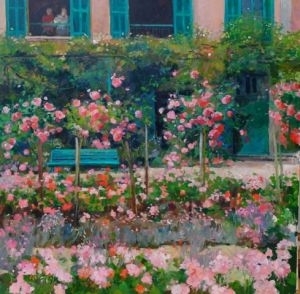 In 1883, he rented Le Pressoir, a long pink house with green shutters and extensive grounds, in Giverny. Initially he did not paint the garden but worked every day on it’s creation, managing much of the labour himself. In 1890, he eventually bought the property as he grew in fame and in wealth. He then was able to employ more than half a dozen gardeners and spend money on plants. Monet’s paintings of the Giverny garden are, of course, world famous, but less well known is the artist’s vast horticultural knowledge. Monet was far from alone in his fascination with the horticultural world. The exhibition will also show masterpieces influenced by gardens from Renoir, Cezanne, Pissarro, Manet, Sargent, Van Gogh, Matisse, including some rare works from Klee, Klimt and Kandinsky. This is a unique opportunity to see the work of some of the most important Impressionist, Post-Impressionist and Avant-Garde artists. 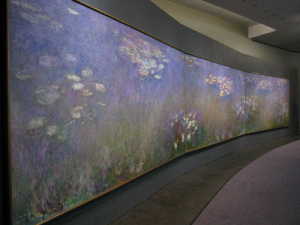 Highlights include a remarkable selection of 120 incredible paintings of gardens, including 35 works by Monet, such as the monumental Agapanthus Triptych, reunited specifically for the exhibition, Renoir’s Monet Painting in His Garden at Argenteuil and Kandinsky’s Murnau The Garden II. Where and When can you see the Exhibition? Painting The Modern Garden: Monet to Matisse is an exhibition hosted at the Royal Academy of Arts, Main Galleries, Burlington House, Piccadilly, London. The exhibition will be awash with “the colour and light of more than 120 works.” It is co-organised by the Royal Academy of Arts and the Cleveland Museum of Art. It runs from 30 January — 20 April 2016. 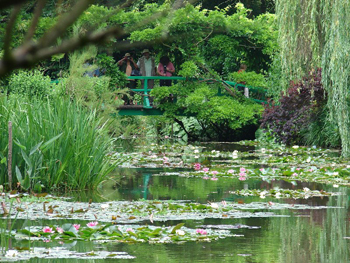 Inspired to Paint in Giverny, Monet’s Garden? Feel inspired to paint some of the finest gardens in France including Monet’s gardens at Giverny? Then join a special instructional painting holiday with acclaimed artist Pamela Kay NEAC, RBA, RWS, ARWS painting the Gardens of Monet in Giverny and in The Loire , 2 – 10 June 2016. Travel in style by private executive coach, take all the painting equipment you wish, stay in a chateau hotel with its own lovely garden and paint every day with Pamela Kay in a different garden. The final garden you’ll be painting is Monet’s in Giverny.